Inauguration photo from the association’s founding in 1992. Front row from the left: Profs. Peter Wolf, F. Manz, K. Schimrigk, Levon Badalyan, E. Gusev, and B. Guekht. A meeting on Diseases of the Nervous System — Mechanisms and Treatment was held April 6-7 in Moscow to celebrate the 25th anniversary of the Association for Promotion of German-Russian Cooperation in Neurology. This association, whose name was later changed to the Russian-German Neurological Society, is perhaps not well known in global neurology, but played an important role in the first period after the European system shifts of 1989-1990. Until then, for about half a century, there had been extremely few possibilities for neuroscientists of West Germany and the Soviet Union to meet and exchange their views or to publish in each other’s journals. The scientific developments on both sides of the Iron Curtain often went different ways, and the post-World War II generations in East and West took little notice of each other. This was quite a change from earlier traditions, and symptomatic of the general disruption within Europe. The new possibilities were first explored by Prof. Jefim Salganik of Gütersloh, a German neurologist who was born in the Soviet Union and had studied medicine in Moscow. He contacted and then visited Prof. Levon Badalyan of Moscow, who had been an opponent for his doctoral thesis. In consequence, a visit of a group of neurologists from northern Germany was organized in February 1991. They met with a group of leading Russian neurologists and their disciples for a seminar, which was held in Moscow and Yaroslavl, Russia. It became an unforgettable experience for all participants. Transportation, lodgings, translations, and meeting facilities, including something as unusual at the time as video demonstrations, needed a lot of improvisation. All difficulties were overcome by the local organizers, and the hospitality was overwhelming. There was great mutual curiosity about the methods and traditions that had developed, and time set aside for discussion was never sufficient. Thus, the last papers were delivered and discussed on the bus, as all drove back together to Moscow through the white winter landscape. It was one of the occasions where enduring friendships arise among people who until then had been foreigners to each other. Both sides expressed a strong interest in establishing a platform for future exchange and meetings. Also, in the German group, many were strongly aware of Nazi Germany’s barbarous actions, especially in Eastern Europe. The German group found it their duty to be the first to reach out to Russian colleagues and integrate them into the common European agenda. 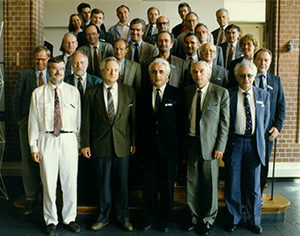 When in 1992 the Russian group was received in Germany for a second scientific encounter, the association was founded and registered in Germany, where it also came to function as a commission of the German Neurological Society. Leading neurologists from both countries (Profs. Badalyan, Gusev, Guekht, Schimrigk, Wolf, Haass, Salganik, Manz, and many others) contributed to the establishment and further development of the society. and became rarer. 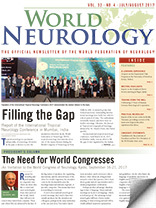 However, in some subspecialties, bilateral cooperation intensified and deepened, especially in stroke, epilepsy, and neuromuscular diseases, where several early association members became national and international key players. The 25th anniversary meeting was a welcome occasion to update newer research and to remember an initiative reflecting very well the spirit and optimism of the early 1990s, which definitely made a change for European neurology. Prof. Peter Wolf is from Dianalund and Florianópolis, and Prof. Alla B. Guekht is from Moscow.